MPs have called for an exhaustive investigation into the buying and selling of concert tickets, following a "disturbing" meeting with the industry. Britain's biggest resale websites are "courting" touts and even offering them "preferential treatment" in a bid to boost profits, a Parliamentary committee heard on Tuesday. Responses from Stubhub and Ticketmaster were "unsatisfactory", MPs said. They will now pursue a "fuller investigation of the whole area". Tuesday's one-off session was supposed to be a hearing on the use of "bots" - automated computer programmes which help touts harvest huge numbers of tickets when they go on sale. However, the committee said evidence provided at the hearing "shed a light on much more far-ranging and disturbing factors in the market". These included "clear indications of too-close relationships between those selling tickets on the primary market and sellers on the secondary market". The committee criticised witnesses for a "failure to give satisfactory answers" on where their profits came from; and questioned resale websites' "willingness" to identify "large-scale ticket touts and fraudulent sellers". Paul Peake, head of legal affairs at the eBay-owned Stubhub, angered the MPs by repeatedly saying the company was "under no legal obligation" to police its site. The committee, in turn, accused resale websites of using music fans as "cash cows", by making them pay inflated prices when tickets appear on the secondary market. They said the biggest resale websites had no incentive to drive down prices, as they took a cut of their sellers' profits. Fans' anger at the market has increased in recent years, as concerts appear to sell out in a matter of minutes, only for tickets to appear on secondary sites almost immediately. Often, these sites charge many times above the face value. 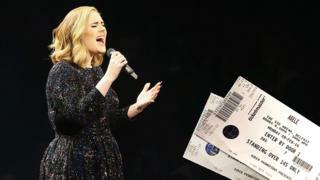 Tickets to see Adele this February were advertised for £25,000, while MPs voiced concerns over Phil Collins' 2017 tour, where prices have reached £2,000 on the secondary market. Conservative MP Andrew Bingham noted that these tickets, listed on the Ticketmaster-owned Get Me In!, could generate up to £600 profit for the company. All of those who appeared at the hearing agreed that the use of "bots" by professional touts was hampering fans' ability to buy tickets when they first went on sale. Committee member Nigel Adams has recently proposed outlawing the use of this software, and the select committee has agreed to table an amendment to the Digital Economy Bill later this month to this effect. The committee is also recommending an HM Revenue and Customs inquiry into the under-reporting of income by known touts, after hearing that the profits declared by "power sellers" often did not match up to the value of tickets they sold through resale sites. The FanFair Alliance, which lobbies for better regulation of the ticketing industry welcomed the committee's decisions. "This is fantastic news for all UK music fans and those who have campaigned so long for action," it said in a statement. "We anticipate that a fuller investigation of this market will lead to much-needed reform." Representatives for three of the four main ticket resale sites - Stubhub, Get Me In! and Seatwave - have declined to comment. Viagogo is yet to respond to a request for a comment on the story.